This entry was posted in Green living, Health, Sustainable development, Urban development on October 26, 2011 by Claire Mathieson. A history of waste management in New York City and composting’s potential to change the city’s relationship with its refuse. It’s no surprise that the most heavily populated city in the world’s most materialistic country has a colorful history when it comes to dealing with waste; while the situation has doubtless improved since visitors dubbed it a “nasal disaster” in 1800, New York City’s streets will probably never be renowned for their olfactory delights. 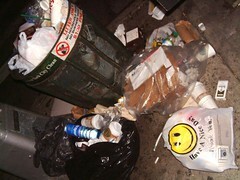 Small hills of bulging garbage bags lining the sidewalks and trash cans bearing the slogan “Keep New York City Clean” overflowing and surrounded by skirts of rubbish are common sights here – keeping a city of 8 million people from going rotten is clearly no mean feat. Still, the waste situation in the city has drastically improved. In 1866, the Metropolitan Board of Health had to ban the “throwing of dead animals, garbage or ashes into the streets,” and after 1872 the city no longer systematically dumped its garbage into the East River – one can only imagine what it would have been like to live here prior to regulations like these. The city is historically noteworthy not just for its questionable past waste practices but also for its pioneering advances; it can claim America’s first garbage incinerator, as well as its first recycling center. However, NYC is also home to the world’s largest landfill, Staten Island’s Fresh Kills. Opened in 1948 and retired after swallowing much of the wreckage of 9/11, it is America’s contribution to the only two man-made objects that can be seen from space, the other being the Great Wall of China. 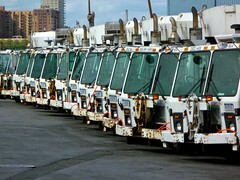 New York City’s Department of Sanitation (DSNY) – responsible for public waste removal since its founding in 1881 as the Department of Street Cleaning – is the biggest sanitation department in the world, with a fleet of 7,899 uniformed workers and 2,230 collection trucks. It manages “over 12,000 tons of residential and institutional refuse and recyclables a day.” Outside of its jurisdiction lies the commercial sector, which “generate[s] another 13,000 tons of refuse each day” that is then carted off by private companies. Though the occasional garbage strike sends the city back to 19th century stink levels, the DSNY’s help has transformed it from an aspiring dump to a habitable metropolis. New Yorkers, however, are clearly still generating waste at an alarming rate, and all of it is has to go somewhere. As DSNY commissioner John Doherty revealed, “most of the waste ends up in probably a dozen or more landfills in Pennsylvania, Ohio, and Virginia.” The problem, then, has not been eradicated; it has been moved. Parades of gas-guzzling trucks export thousands of tons of one city’s trash each day, depositing them in landfills for the residents of other cities to deal with. The best way for New York City to make its way towards true sustainability and to cut back on its modern need to dump on other states the refuse it once threw into its own streets and rivers is to reduce waste at the source. This is a challenge that may prove even greater than sanitizing a city, but it is one we must undertake. Because food is – and always will be – such a large portion of what we consume, composting stands out as a feasible solution that cuts down on waste immediately. At present, though many restaurants recruit private companies to take care of food waste, composting does not make up a significant portion of NYC’s municipal waste program. According to Natalie Wesson, Project Coordinator for the NYC Compost Project in Manhattan*, the only public collection program – through which leaves and Christmas trees are gathered and composted – has been frozen until fall 2012 due to budget restrictions. While New York is unlikely to start a more comprehensive composting program anytime soon considering the state of its current one, the DSNY’s “Composting in New York City: A Complete Program History” declares that 55% of the city’s waste post-recycling can be biodegraded, and “[c]omposting represents an important option as the City looks to increase its recycling rate in the face of the closure of its last active landfill and the mounting cost of exporting garbage.” Though it is unclear when such a program might become a reality in NYC, the city could clearly benefit from following other large municipalities like San Francisco and Seattle in establishing a curbside composting program as the next chapter of its history with waste.